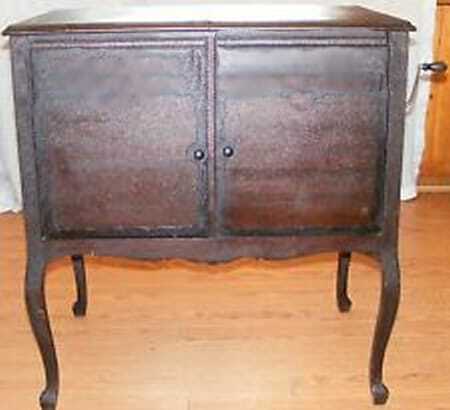 I was super excited when we scored this awesome antique cabinet recently. 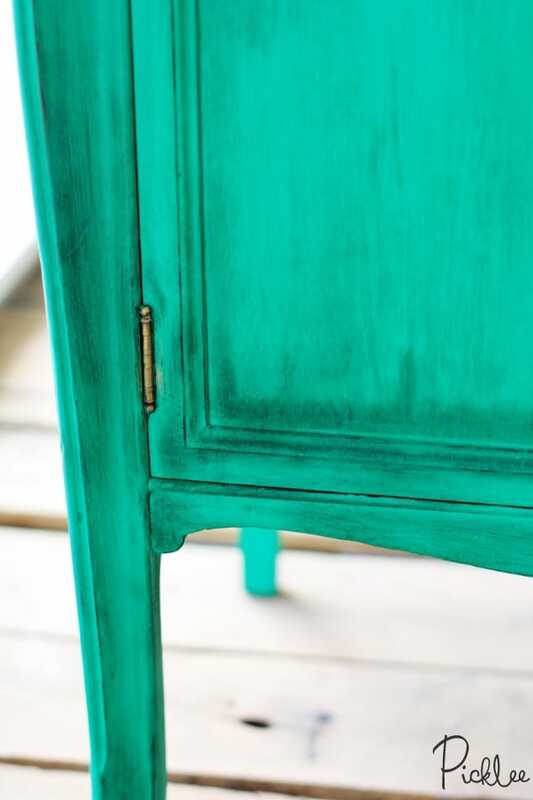 It had a deep, dark walnut finish that I knew would work beautifully with a rich, vibrant color. It wasn’t until I really started inspecting it, that I realized it was actually an antique phonograph cabinet that had been converted into a regular cabinet at some point (probably decades ago). I just love pieces that are packed with history! Unfortunately, I was so excited about refinishing this piece that I forgot to snap a before photo, so I found this almost identical cabinet online, just to give an idea of how this beauty looked before it’s transformation. One of my favorite advantages of working with chalk & clay paint is that the natural chalk finish sometimes allows character rich wood stains to peak through on antique pieces. I can always tell when I have this type of piece, because they start out as a super deep, almost oily finish (usually a walnut or mahogany). This always excites me because the deep stains interact beautifully with rich paint colors. 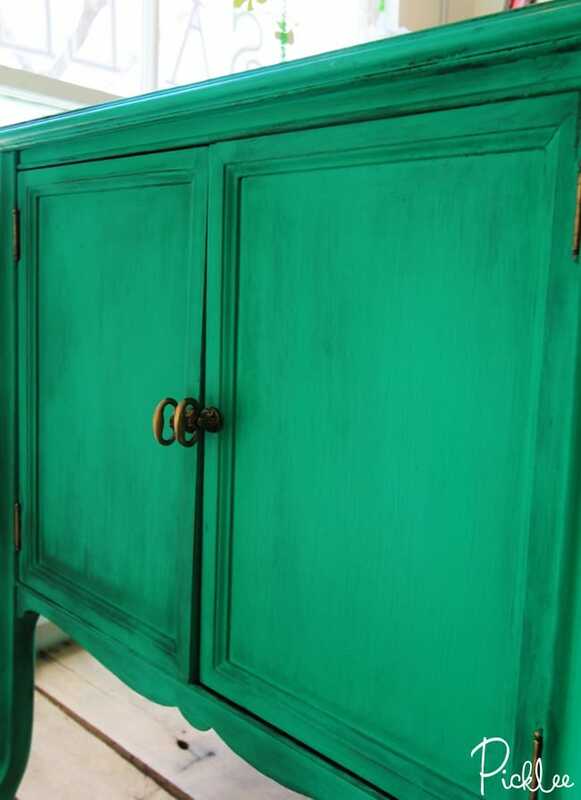 For this cabinet, I decided to use CeCe Caldwell’s Emerald Isle, which is a deep emerald green. I only ended up applying one heavy coat because I LOVED how the stain started interacting with the emerald color! After the first coat was dry & set (a few hours later), I buffed on a coat of CeCe Caldwell’s clear wax to seal the cabinet. You can see where the dark stain pulled through the paint on the entire piece, it really gives this cabinet an authentic, aged feel! 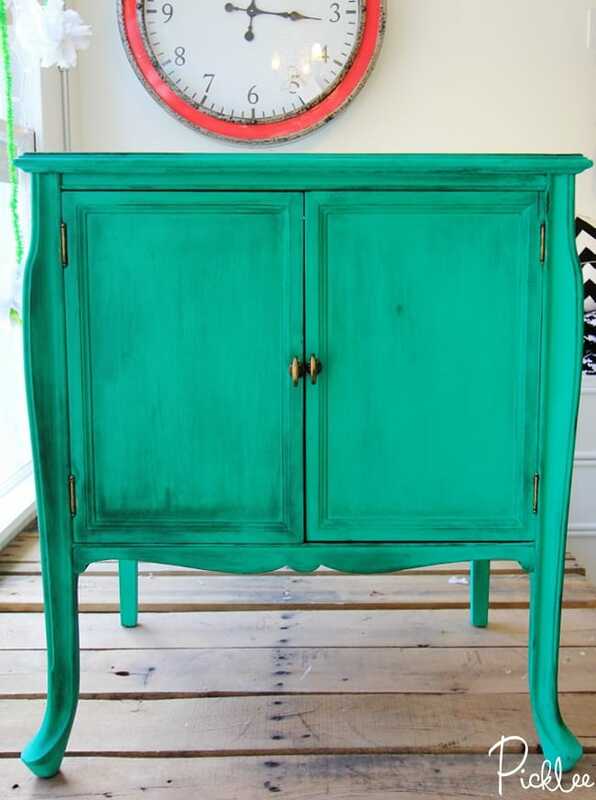 Find more chalk & clay paint transformations here!